The Demon Lord’s Ring! The ring that he had stolen from that Dragon’s hoard located deep in the cave off of the coast of Jalam. Frotho had had only a short amount of time in which to decide which portion of that Dragon’s treasure to make off with before that sleeping draught he had slipped her wore off! He decided upon that treasure chest that was the most heavily secured item in the entire cave! Diamond necklaces, great golden goblets, emerald diadems, all of those were just lying about unsecured. But that one treasure box that stood alone, caught his eye. His thieving skills made short work of the locks that sealed it to its pedestal. Afterwards, Frotho was surprised by its lightness! He had scant time to puzzle over that mystery. Barely did he have it free before he heard the snorting of the Dragon as she started to grumble herself awake! So he ran off with his swag! He ran so far and for so long until at the last his legs failed him. Finally, after what seemed forever, he caught his breath. Finally, he unlocked his prize. Oh, the oaths he uttered upon discovering that the box held but a single golden ring, wrapped in samite! In frustration, he smashed that damnable box, scattering its pieces in search of the real treasure, perchance in some hidden compartment? But no, there wasn’t anything else! Curiosity born out of frustration, Frotho put on that ring and discovered its secret: it was a Magical Ring of Invisibility! It was like something out of legend! After that, his thieving luck improved dramatically! Other people’s property just came naturally to him then! How could he ever have lived prior without his precious ring! But even then, he had no idea of just how much power that ring of his held! Swiftly, he discovered that Monster-girls would longer threaten him no more! Yet, with all that power, he felt empty. It was almost as if he were missing a part of himself. Soon after, he began to dream of all things: a Dark Elf maiden! Every night, that wondrous creature would come and tantalize him in his dreams. He just knew that she belonged to him! But, he had no idea where to find her! If it weren’t for that chance encounter with the Dark Mage Gallandia, at the inn of the Prancing Cadaver in Cynosure, he might never have discovered his true destiny. She was most impressed with him after he had bought her a drink, and after much ale had flowed, she accompanied him to his room and there he showed off his Magic Ring to her. It was there that she performed a test that made him cry out with fear- she threw his ring into his room’s fireplace! But instead of melting, strange glowing writing appeared upon its surface. That high and mighty Dark Mage vanished when that writing became visible. In her place, there appeared a different Dark Mage, a timid one that deferred to him. Out loud he wondered why the ring’s writings would change her behavior so. “It is the One Ring, Frotho!” She whispered, her voice quivering with fright as she clung to him fearfully. Before he could ask what this One Ring was, she continued. “It is the Demon-Lord’s One Ring! The ring of ultimate power that she lost in a terrible battle with the Chief God, ages ago!” He gasped in shock at that news. “You may very well hold the fate of the world in your hands! What will you do?” She said, gaping awefully. “What must I do?” Frotho said, slurring his words. “You must go on a Quest! You must leave tonight! Travel light! Tell no one! Avoid as many as you can!” She then sighed dramatically. “Where must I go?” he asked, as he stumbled around his room, trying to dress himself. “You must travel South! To the Fortress of the Council of the Wise. Which is cleverly disguised as a tumbledown cottage located just off of the Caravan road, three days travel from here!” She replied, as she helped him pack his saddle bags. “What will you do?” He asked, suddenly. “I will stay here tonight! So as to fool your pursuers!” she said breathlessly. “What pursuers?” He asked, confused. “eeew.” Was all he could manage, as he shouldered his saddle bags. Finally, in farewell, Gallandia gave him a long, passionate, adoring, kiss before sending him on his way. And then, three ale-sodden mornings later, as per Gallandia’s directions, lay the Council’s Fortress. It was indeed a very cleverly made disguise. He couldn’t tell the difference between it, and every other tumbledown cottage he encountered before. Within that cottage he met Sharsa Grimfury, the Dark Elf-maiden who had been haunting his dreams for far too long. “Do you like what you doth see . . . ?” said the voluptuous Dark Elf-maiden as she provocatively parted the folds of her robe to reveal the rounded, shadowy glories within. Frotho’s throat was dry, though his head reeled with desire and ale. She slipped off the flimsy garment and strode toward the fascinated human unashamed of her nakedness. She ran a perfect hand along his hairy chest, and he helplessly watched his hair curl with the fierce insistent wanting of her. “Let me make thee more comfortable,” she whispered hoarsely, fiddling with the clasps of his jerkin, loosening his sword belt with a laugh. “Touch me, oh touch me,” she crooned. Frotho’s hand, as though of its own will, reached out and traced the delicate swelling of her Dark Elf-breast, while the other slowly crept around her tiny, flawless waist, crushing her to his barrel chest. “Hairy chest, I love a hairy chest,” she moaned, forcing him down on the silvered carpet. Her tiny, pink fingers caressed the luxuriant fur of his pectoral muscles while Frotho’s nose sought out the warmth of her precious long pointed Dark elf-ear. “But I’m so tall and hairy, and . . . and you’re so beautiful,” Frotho whimpered, slipping clumsily out of his crossed garters. The Dark Elf-maiden said nothing, but only sighed deep in her throat and held him more firmly to her faunlike body. “There is one thing you must do for me first,” she whispered into one rounded ear. “Anything,” sobbed Frotho, growing frantic with his need. “Anything!” She closed her eyes and then opened them to the ceiling. “The Ring,” she said. “I must have your Ring.” Frothos whole body tensed. “I must have it,” she said both tenderly and fiercely. “I must have the Ring!” Frotho’s eyes blurred with tears and confusion. “I can’t,” he said. “I mustn’t!” But he knew resolve was no longer strong in him. Slowly, the Dark Elf-maiden’s hand inched toward the chain in his vest pocket, closer and closer it came to the Ring Frotho had guarded so faithfully. “I have to admit, Takane. “ Gallandia said, ”I would never would have guessed that this madcap scheme of yours would turn out so well.” Takane the Danuki, smiled at that compliment from her business partner. They both sat in folding chairs next to Takane’s hidden vardo. Which itself was located near some trees next to the tumbledown cottage. Gallandia accepted the bag with a satisfied smirk, and tucked it away into a pocket of her satchel. She then pulled out another one of ‘The Demon-Lord’s One Ring’ from a different pocket. Holding it up in the light, she couldn’t help but admire it. Takane finished for her, “And with the Tracking spell, allows you or one of the other Dark Mages in my employ, to nudge or delay him accordingly.” Takane sighed as she poured the two of them a celebratory drink. “All the while, he’s being corrupted by his intended bride’s Demonic Energy in his quest.” Gallandia started giggling as she accepted her drink. “A Quest! I think that’s the most hilarious part!” she guffawed. “A lone human male thinks that he, and he alone, can take on the Demon-Lord in all of her might, and succeed in overthrowing her? !” Takane maintained her pleased poise as she sipped her wine. “Of course. “ Gallandia agreed, toasting Takane’s ingenuity with a raise of her cup. Just then, Gallandia and Takane’s turned their heads to watch, as the cottage’s front door creaked open as Sharsa and her new husband came out. Frotho was grinning happily as he crawled out of the cottage on all fours, led by the leash around his neck that the Dark Elf held in one of her hands. Sharsa waved to the pair happily as she smiled with satisfaction. That satisfaction increased, when her husband debased himself properly to be used as a stepping stool, so as to allow her to climb up onto his palfrey. She then allowed him to seat himself behind her, as they began their long journey to her home. “There goes another gratified customer.” Takane said, grinning as she watched the two depart. “So how many does that make?” Gallandia asked, switching to business mode. And with that, Gallandia teleported herself away to meet and delay the future husband of the Ushi-Oni. Takane, sat back into her portable chair and began to read yet, again, her favorite work of fiction that she had found in a Cynosure used-book store. That ‘paperback’ book that had been supposedly imported from the Musume world. 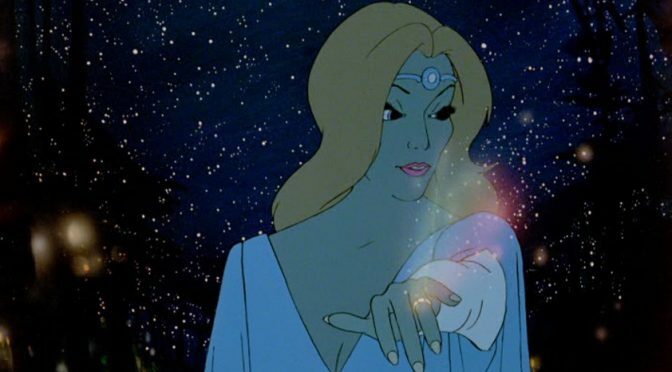 and to Ralph Bakshi for my stealing of his Galadriel work for the media at the top of this page. You will always be my Movie Standard for the Lord of the Rings. Going to be honest, I didn’t expect the story to go this way. I legitamely thought this was going to be a Lord of the Rings recreation with Monster Girls. Sounds to me like you’ve got yourself a story premise. Why don’t you run with it? Actually yes, I prefer honesty. From inspiration to posting- less than 24 hours. I really need to edit this up a bit sometime. I have way too many commas.